GSGSSI has been online since 2001 and a lot has changed in the fourteen years since. When the first GSGSSI website was launched the internet was not yet available on South Georgia, and access from the Falkland Island office was very limited, so most GSGSSI administration was done without it. Satellite internet arrived on South Georgia in 2007 and from then on the amount of content on the website increased rapidly. In a drive for better communication and greater transparency, GSGSSI has published an increasing number of documents online, including financial statements, annual reports, laws and environmental publications. One of the popular features of the website remains the two webcams which transmit new images from King Edward Point (KEP) every few minutes. The webcams have had more than 3 million views so far. Regular visitors to the webcams can catch glorious sunrises or sunsets, often augmented by the presence of penguins or seals, or else camera lenses obsucured by snow as another blizzard passes through. In 2014 GSGSSI entered the world of social media and launched its Twitter feed @GovSGSSI so that the Government could share information about the Territory with an even wider audience. The Twitter feed generated more than 2.8 million views in the first eleven months of operation. For those who are not Twitter users, the Twitter feed is embedded in this website so they can enjoy the regular updates and pictures from the island. The new look website has been designed to be easier to navigate and search, so providing a more accessible portal for those interested in finding out more about the island. It also has more photographs that capture the stunning wildlife and landscapes. For those on the move, the site is optimized for viewing and using on mobile phones. The content has also been updated, providing the latest information in key areas of interest under the headings: Visitors; Environment; Fisheries; Heritage; Science and Information. More than 250 documents are now available to download in the document library, and a live search function makes it easy to find what you are looking for. The archive of all the back copies of this monthly website newsletter are also available. The Government of South Georgia & the South Sandwich Islands (GSGSSI) hosted its annual UK stakeholder meeting on Monday 21 September in the Foreign & Commonwealth Office. The meeting was an opportunity for the Commissioner and new Chief Executive to meet stakeholders, report on work undertaken over the past 12 months, and engage in discussion on future plans as part of the consultation on the new 5-year GSGSSI Strategy 2016-2020 due to launch in November. There was also an opportunity for stakeholders to see a preview of the results of the exciting work being done to laser survey South Georgia’s whaling stations – once complete, the results of the survey will be screened in the refurbished Slop Chest. This year GSGSSI also held a stakeholder meeting in Oslo on Wednesday 23 September which highlighted the diverse interests in South Georgia within Norway. They were hosted by the Norwegian Ministry of Foreign Affairs with whom they had the opportunity to discuss shared interests and future collaborations in South Georgia. We are sorry to report that Roger Huxley, died on September 5th aged 76. In the early 1990s he was First Secretary and dealt with South Georgia affairs. Roger Huxley was from Stratford-upon-Avon, England. At the age of seventeen he joined the merchant navy but apparently colour blindness prevented him staying at sea. He returned to Stratford where he worked at the theatre. 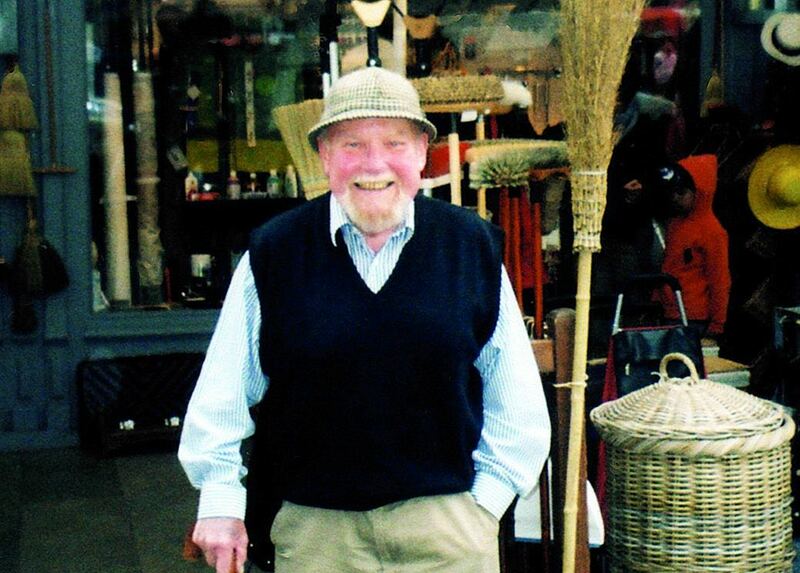 His next job took him to the north of Scotland to track Russian submarines during the Cold War, after which he joined the Diplomatic Wireless Service at GCHQ Bletchley Park. In 1966 he married Enid (Niddy) John. He transferred to the Foreign and Commonwealth Office (FCO) and his first posting was to Singapore where his two daughters, Sian and Karen, were born. His career with FCO meant he travelled widely, and was often involved in aid work. He went to the Far East, Somalia, Europe and the Middle East. He was in Abu Dhabi in 1986 when civil war broke out in Aden (Yemen) and was involved in organizing the evacuation of the British and other foreign citizens. Part of the multi-national fleet co-operating to get people out of the bloody conflict area was the Royal Yacht Britannia which was in the area having been to the Red Sea. With the Queen’s permission, the vessel was used in the evacuation, the first time it had been used in such a way. Roger Huxley was involved in evacuation of Aden. 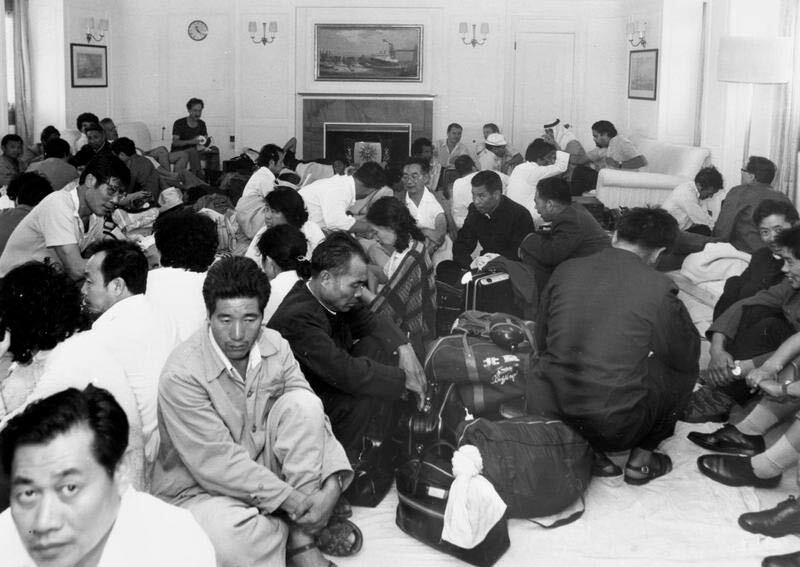 Here the Drawing Room aboard the Royal Yacht Britannia is being used as a temporary dormitory by British and foreign national refugees picked up on Khormaksar Beach on 17 January 1986. Photo Imperial War Museum © Crown copyright. IWM (HU 74275). In 1990 Roger Huxley was appointed First Secretary based at Government House, Stanley, and until 1994 Roger was also Assistant Commissioner for South Georgia. At that time a major part of the role was the day-to-day management of South Georgia affairs. The South Georgia administration was much smaller then than it is today and was made up of the First Secretary who worked part time on South Georgia matters, overseen by the Commissioner (who is also the Governor of the Falkland Islands) and the FCO in London, and with the assistance of the other Government House staff and one Marine Officer (now called a Government Officer) based on South Georgia. He only visited South Georgia once, in1991, but he maintained a lively interest in events there and when a fishery zone was established he became for a while Director of Fisheries for SGSSI. After he left the Falklands he went to London before his final posting of his FCO career to Ascension Island where he was Administrator from 1995-1999. During his tenure he encouraged the island’s residents to become more involved in the running of the island, and also published a book on green turtles. He and Niddy retired home to Stratford where he busied himself in community life including serving on panels for Warwick Hospital. He demonstrated a sustained interest in South Georgia matters by becoming the first Treasurer for the newly formed South Georgia Association (SGA). Roger died unexpectedly suddenly whilst on boating trip in Russia. His life was commemorated in his home town of Stratford-upon-Avon in the Church of the Holy Trinity (Shakespeare’s Church) on September 25th. It was a rousing service before a full congregation. The South Georgia Commissioner (and Falkland Governor) at the time Roger was working in the Falkland Islands was David Tatham who wrote that, “Roger was a popular member of the community in Stanley, a keen golfer with a strong sense of humour. After retirement, his annual Christmas letters had a wide, appreciative and amused readership.” Roger’s daughter Karen described her father as a caring diplomat, loyal friend, maverick hat-wearer, racy joke-teller, witty raconteur, patriot and gentleman. A new South Georgia and the South Sandwich Islands (SGSSI) coin was released in September to celebrate HM Queen Elizabeth II becoming Britain’s longest reigning monarch. The day of the new coin’s release, September 9th, was the day the Queen passed the record set by her great-great-grandmother Queen Victoria as the longest ever reigning monarch in British history. Queen Victoria came to the throne at the age of eighteen and died in 1901 when she was eighty one. She reigned for 23,226 days, 16 hours and 23 minutes – over 63 years. Queen Elizabeth II became Queen aged twenty-five in 1952. The SGSSI coin features a portrait taken in 2011 during the wedding of the Duke and Duchess of Cambridge. The Buckingham Palace balcony is included on the coin. It forms part of a series of coins from four different British Overseas Territories commemorating the event. The other coins were released on the same day by the Falkland Islands, Ascension Island and the British Virgin Islands, and each features a portrait of Her Majesty throughout her life. The Falkland Islands coin has a portrait from 1953 from the Queen’s Coronation and includes the Privy Mark of Westminster Abbey. The Ascension Island coin has a portrait from 1957 from the Queen’s first televised Christmas Message and includes the Privy Mark of Sandringham from where the message was televised. The British Virgin Islands coin has a portrait from 2012 from the State Opening of Parliament and features the Privy Mark of the Houses of Parliament. According to the Guinness World Records, the Queen also holds the world record for most currencies featuring the same individual. 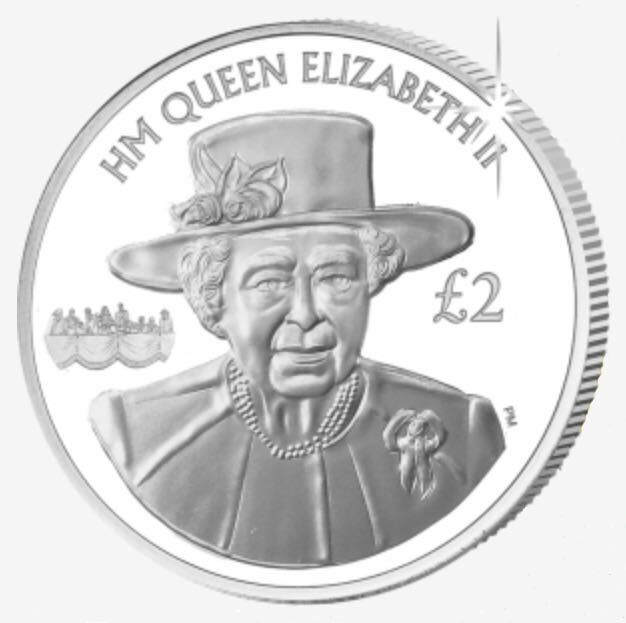 The obverse of each of the newly released coins in the HM Queen Elizabeth II: Longest Reigning Monarch series features an effigy of Her Majesty Queen Elizabeth II by Ian Rank-Broadley FRBS. They are available in cupro nickel and limited edition proof sterling silver. You can buy the South Georgia coin from Pobjoy Mint here. A major new exhibition on Shackleton’s Endurance Expedition will open at the Royal Geographical Society (RGS), London, in November, with an off-shoot exhibition coming to South Georgia early in 2016. The exhibitions are inspired by the glass plate negatives taken by Endurance expedition photographer Frank Hurley. The RGS exhibition ‘The Enduring Eye: The Antarctic Legacy of Sir Ernest Shackleton and Frank Hurley’ opens on November 20th. 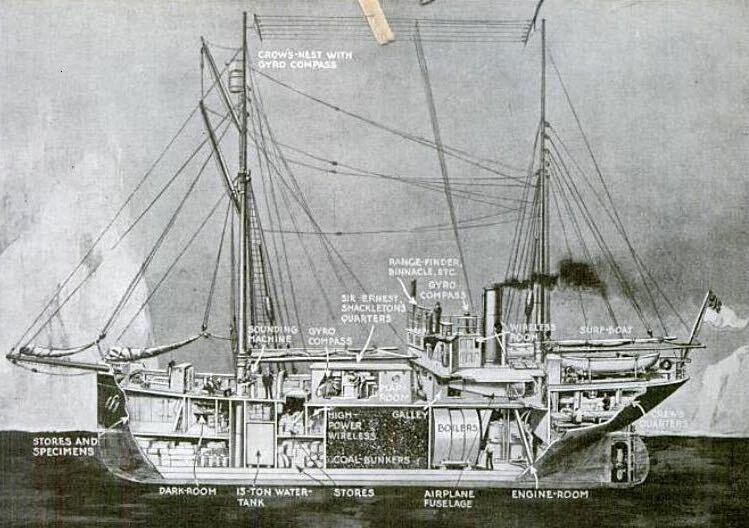 Cutaway diagram of Shackleton’s last expedition ship Quest showing his cabin on deck amidships. Image from the Popular Science Magazine 1921. The deck cabin from Shackleton’s last expedition vessel Quest has recently arrived in Ireland en route to a new home at the Athy Heritage Centre. Shackleton died in the small cabin whilst Quest was anchored in King Edward Cove at the start of the Shackleton-Rowett Expedition in 1922. The cabin was removed from Quest during a refit in 1924. For some years it was used as a hut in a field in northern Norway. It was owned by Ulf Bakke and was recently moved to Sandefjord where it underwent some refurbishment. The cabin has now been further restored and moved to Ireland. Its new home in Athy is close to where Shackleton was born. The cabin joins several other notable artefacts at the Athy Heritage Centre including an original sledge and harness from one of Shackleton’s other Antarctic expeditions. The Heritage Centre hosts the annual ‘Shackleton International Autumn School’ (see below). 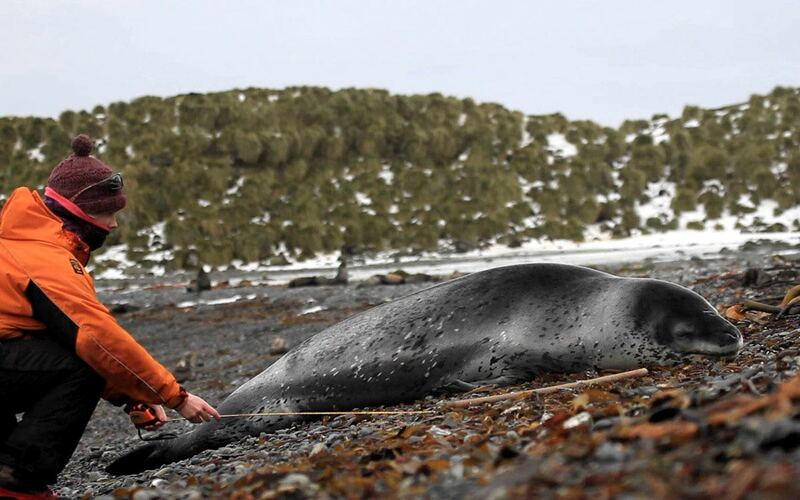 The penultimate month of the annual leopard seal surveys has been by far the most exciting. September was the busiest month yet for leopard seal sightings. It has been such a joy to see these magnificent predators every day. A young lep, named Melvin, has been a regular visitor to the beach in front of base. When the sheathbills aren’t pecking at him, he sleeps all day. One snowy morning he flopped onto the beach carrying a whole, but dead, penguin, and proceeded to guard it from the sheathbills and then take a nap next to it. I wondered if this was the leopard seal equivalent of a cat bringing home a dead bird as a present to its owners… Melvin has of course been feasting on many penguins, which are found in the scats he deposits on the beach, but it’s a mystery why he did not eat this particular one. 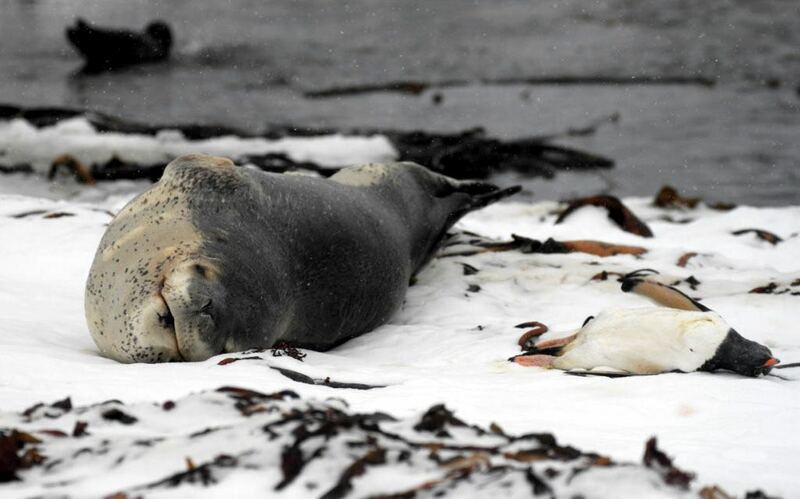 After bringing a dead penguin ashore the leopard seal Melvin guarded his potential meal. Photo Siân Tarrant. There have been other young leps around this month. They tend to make the most interesting sightings, perhaps they are more curious, but their older counterparts seem mainly lie motionless in the water, making it a challenge to get those all important ID photos! Measuring Simone. Photo Siân Tarrant. There have been a number of big elephant seal males turning up on the beaches, which has been awesome to see. I love their big fat wrinkly noses. They let out huge loud bellows, which can be heard from quite a distance away! We have our fingers crossed that we’ll get some females and pups next month. The first giant petrel egg was laid on September 14th, another 94 eggs have been laid by the geeps since, which is roughly a third of the total eggs that will be laid this season. Surveys of the mollymawk albatross colonies started on September 1st. The first bird returned on the 6th, and we have been recording the ring numbers of each individual. As the numbers build up, the birds have been busy doing up their nests, and flirting with potential partners. One bird that returned this year is a 53 year old grey-head. He was born in 1962. 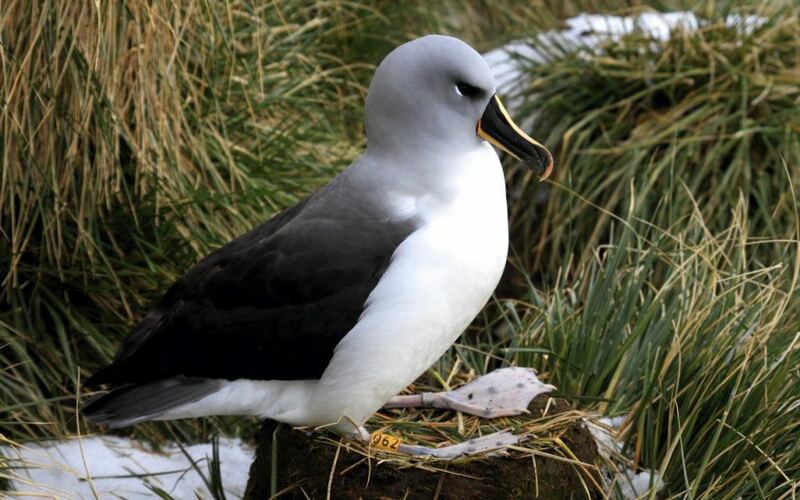 Grey-heads on Bird Island have been known to reach the age of 60, so he still has many years left in him! Another bird that has returned this year has been with the same partner for 25 years. Is that his age or his ID number? Toothfish Day: Did you know that one of the South Georgia Bank Holidays is ‘Toothfish Day’? Instituted a year ago, the holiday, which this year fell on September 4th, replaced a previous undesignated bank holiday. The SGSSI bank holidays are set by the Commissioner and include the Queen’s Birthday and Possession Day (the day the island was claimed for King Georgia by Captain Cook) along with the more usual Christmas and Easter holidays. Shackleton’s medals will be sold at auction. Photo Christies. 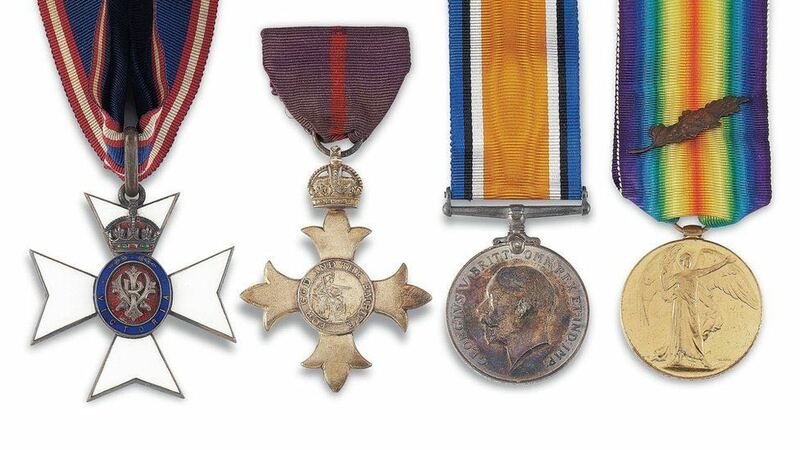 Some of Shackleton’s medals are being offered for sale by auction at Christies Auction House, London. The fourteen lots are included in the ‘Travel Science and Natural History Sale’ on October 8th. The medals include the medal Shackleton received when he was made Commander of the Royal Victorian Order for reaching the farthest South (estimate £20,000 – £30,000), Shackleton’s Royal Geographic Society Silver Medal – received for his role in the 1901 Discovery Expedition (estimate £20,000 – £40,000) and the Chilean Order of Merit awarded in 1916 after the safe rescue of the Endurance crew – for, “astounding resolution in the face of danger and for his indefatigable commitment to the welfare of his crew” (Value £4,000 – £6,000). Shackleton’s Boat – New Book: A new edition of the book ‘Shackleton’s Boat’ has been published. 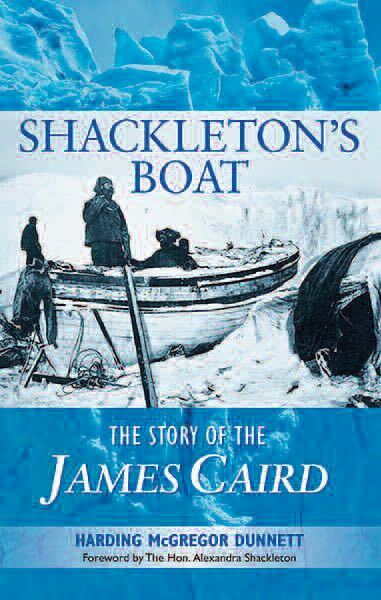 It is the story of the Shackleton’s lifeboat James Caird by Harding McGregor Dunnett. The James Caird, a 23-foot lifeboat, is an unlikely hero, but it completed the most desperate and celebrated open boat voyage in history. Three of the six on board the tiny craft as it sailed from Elephant Island to South Georgia were Ernest Shackleton, Tom Crean and Frank Worsley who are now some of the most recognised names in Antarctic and Polar history and literature. The book tells the story of the little boat, from its commissioning by Worsley to its dramatic escape from Antarctica and on to its final resting place at Dulwich College in the UK. ‘Shackleton’s Boat’ is a memorial to a vessel famous in maritime history, and a story whose heroism has inspired generations. The 240-page paperback book was published by The Collins Press in August and has a foreword by Shackleton’s granddaughter, The Hon. Alexandra Shackleton. Tourist Season Starts: An early start to the South Georgia tourist season came with the arrival of a ski-expedition group aboard charter yacht Le Sourire. The expedition group, called ‘2014 Montagnes du Monde’ consisted of two mountain guides and six other skiers. They were delighted to find plenty of winter snow still coating the island, but had to change their plans to attempt the Shackleton Traverse due to sustained poor weather. Instead the party skied in the Possession Bay area but the very strong winds meant they only had one night ashore. After visiting Grytviken they then headed southward to try for another long ski traverse on one of the glacier routes leading to the southern tip of the island. It is now possible to buy South Georgia and the South Sandwich Islands stamps and First Day Covers on line. For the first time ever, you can order and pay for philatelic goods to be sent from the Falkland Islands. 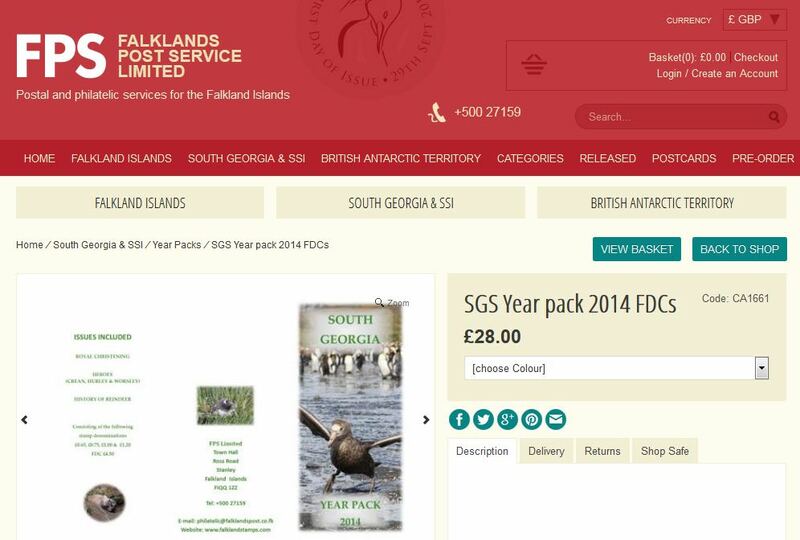 The new and attractive website has been set up by the Falklands Post Service Limited who are the postal service providers for South Georgia and the Falkland Islands. The new on-line shop is welcome news for stamp collectors and South Georgia fans. The new website also allows you to purchase all the South Georgia First Day Covers or stamps and sheetlet releases for one year in one attractive package. Whole packages from 2014 are currently available. Endurance – from Fjeldvig to the Weddel Sea: Shackleton’s ship Endurance was built in Sandefjord, Norway, in 1912. The wooden ship was constructed at the Fjeldvig Shipyard and was originally called Polaris. The ship had been ordered by another polar great, the Belgian, Adrien de Gerlache, who intended using her for polar tourism in the Arctic. After getting into financial difficulties he sold the ship in 1914 to Sir Ernest Shackleton who wanted an ice-strengthened ship for the Imperial Trans-Antarctic Expedition. The vessel’s technical drawings, which are in the Hvalfanst Museet (Sandefjord Whaling Museum) archives, have been used, together with photographs and other historical documents related to the building process, to make a short film which is now being shown at the Sandefjord Whaling Museum. There are both English and Norwegian versions of the film and the film will be shown until June 2016. Six or More: How can you tell the age of a black-browed albatross? Some of the earliest scientific work done on Bird Island was bird ringing in the 1950s, and this has shown that black-brows are are long lived; reaching ages of more than fifty years. But can you tell their age using any other method? Researchers looking for signs of ageing in the birds have now worked out that up to the age of six it is possible to use physical indicators to tell the birds’ ages. They have described how to do so using things like moult status, wear, plumage and bill colour. However, they concluded that after the age of six the majority of the birds could not be aged accurately using these methods. Their findings have been published in a paper entitled ‘Ageing criteria for the black-browed albatross’ in the journal British Birds (Vol. 108). The Yorkshire Ones in Antarctica: An art exhibition to commemorate Shackleton’s Endurance Expedition and to commemorate the Hull locals involved in the expedition. The artists, whose works include textiles, ceramics and metal works are also mainly local. The exhibition is running until the end of October at the Hull Maritime Museum. Open daily. By Endurance we Conquer: Shackleton and His Men: The Polar Museum at Scott Polar Research Institute in Cambridge is hosting a centenary exhibition to commemorate all the men who sailed with Shackleton aboard the Endurance. The men in the Ross Sea Party that laid the supply depots for the planned crossing of the Antarctic continent, and three of whom lost their lives, will also be commemorated. The exhibition opened on September 22nd and will run until June 18th 2016. Grytviken whaling station under Mt Hodges on a calm winters day.